What really drives political participation? 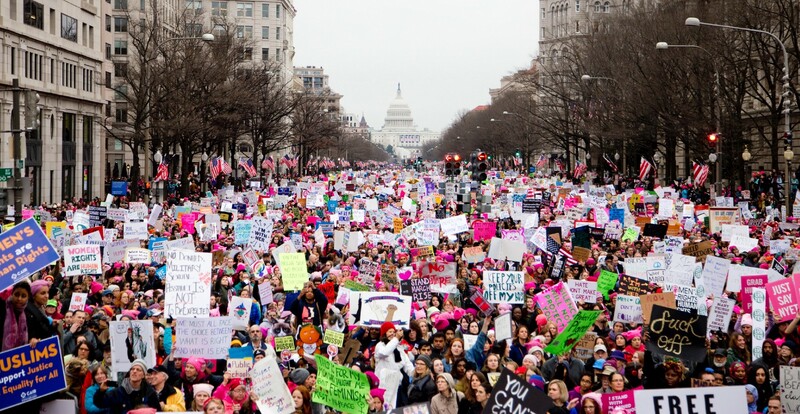 In the wake of the 2016 election, we’ve seen a surge in political participation as organizations across the country have coalesced to form the resistance movement. Groups like 5 Calls, Daily Action, and Swing Left are organizing citizens to take action by calling elected officials, attending town hall meetings, and donating to progressive causes. The challenge for many of these organizations is that motivating people to take political action for the first time is difficult — and even more difficult to sustain engagement in political action over the long run. So what really drives political participation? And what should political organizations be doing to keep citizens engaged? At CitizenBe, these are some of the questions we’re tackling. People are planning to take fewer actions in the future. Eighty percent of people reported taking at least one civic action in the last month, but 72% of these same people reported that they planned to do less in the following month. We found that people reported taking 2.5 actions in the previous month, but were only planning to take 1.2 actions in the future. One explanation for this dropoff in past vs future political actions is a psychological phenomenon called moral licensing, which occurs when a person gives themselves permission to do something “bad” (e.g., stop taking political action) because they’ve just done something good. For instance, people who organized a local march might use the time and energy they spent planning as a justification for doing less in the future because they feel like they’ve already done their part. Fortunately, this isn’t the end of the story. Our findings also suggest that the way people feel during their recent actions may influence their willingness to act again. Below, we offer three suggestions for organizations or activists groups who have the goal of sustaining long-term engagement in political actions. 1. Invest in helping people feel good about their actions. 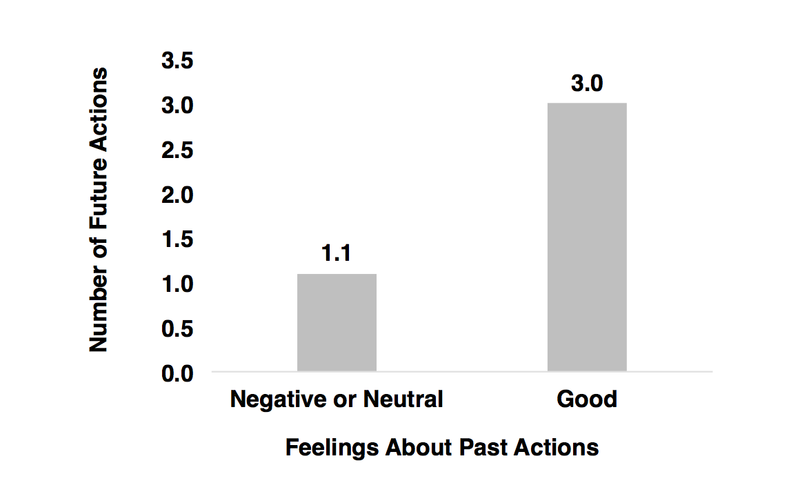 We found that people who felt good while taking past actions were willing to take more actions in the future than people who felt negative or neutral. This finding highlights the importance of considering the way political actions make people feel. Activist groups may want to pay special attention to the whether people are having fun while taking action and/or ensure people are taking actions that match their skillsets and interests. 2. Pay particular attention to ensuring the people most committed to your cause feel good about their actions. We found that on average, people who reported high commitment to political participation in the resistance movement were willing to take 1.9 actions in the future if they reported feeling good about past actions, but were only willing to take 0.6 actions in the future if they have low levels of good feelings about past actions. 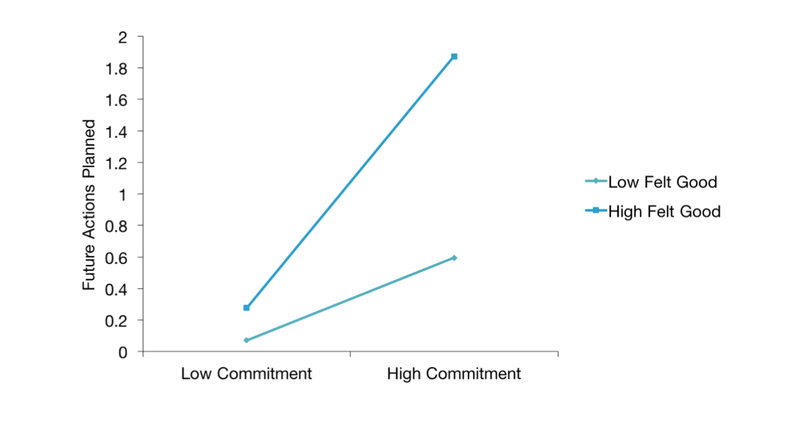 People with low levels of commitment on average had very little willingness to take action in the future regardless of whether they felt good about their past actions. This finding is somewhat counterintuitive because one might expect that highly committed individuals would be motivated enough to plan future actions, regardless. But instead, the most committed individuals are exactly the demographic of people activist organizations may want to target to make sure the actions they’re engaging in are pleasant, enjoyable experiences. Doing so may result in better long term engagement from a group of people who are already committed to participating in the resistance movement. 3. Demonstrate that taking action is a social norm. 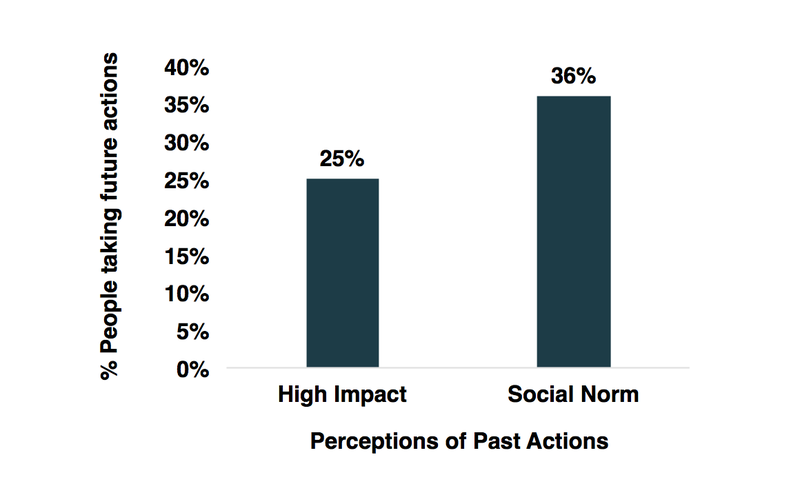 We found that on average, people who felt their past actions were a social norm were significantly more willing to take future action than people who believed their past actions would have a high impact on the political system. CitizenBe is a non-profit group of social and behavioral scientists that works to create and sustain impactful political participation. We help groups become more effective through evidence-based research and testing. If you’d like more info, please reach out to us at info@citizenbe.org. CitizenBe is a non-profit group of social and behavioral scientists that works to create and sustain impactful political participation.